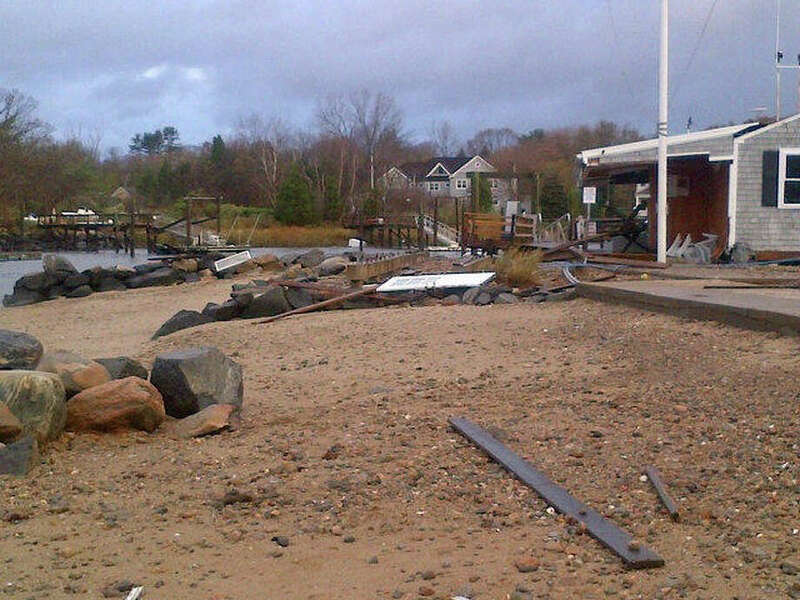 The Darien Boat Club was extensively damaged by Hurricane Sandy. Flood damage -- estimated by officials to be major -- from Hurricane Sandy is still being assessed in Darien. There is no specific information yet on the extent of the flood damage in Darien because downed wires and trees have been preventing crews from entering the flooded areas, but Marc McEwan at the Emergency Operations Center said the areas all along the coast, including Tokeneke, Rings End Road, Long Neck Point Road, Holly Pond Area, Goodwives River and Nearwater Lane, experienced major flooding. On Monday in the early evening, First Selectman Jayme Stevenson and the staff of the Emergency Operations Center were anxious that not only was the town expecting an 11-foot, higher-than-normal high tide, but also a shift in the wind that pushed the water on shore and particularly at high tide at midnight. On Tuesday, McEwan said, "Currently, we're still assessing the damage and the areas of town have been cut off from accessibility. We have very limited information as far as what was damaged and how badly it was damaged." He said there is a list of about 30 homes with damage but the extent is uknown. "I know the Darien Boat Club and the Noroton Yacht Club had extensive damage," McEwan said. "There was some damage that was done Nearwater Lane." Access to Nearwater Lane was opened Tuesday afternoon so town crews will be able to begin assessing the damage. Most people heeded the evacuation warnings and CodeRed alerts, said McEwan, that were delivered prior to Hurricane Sandy. Some people, however, decided to ride out the storm in their homes in the beach area. According to the Darien Fire Department, there were some families that needed evacuation during the storm and that the Manchester Dive Rescue Team assisted in that effort. A task force was dispatched as an extra resource, and rafts were needed. A few people had to be extracted in the area near Contentment Island because of high water levels.